February is just about to knock on our doors and it seems everybody is gearing up for the Valentine’s Day. Now, since everyone will be busy making reservations in some of the best restaurants in Delhi, isn’t it worth checking out the top 5 restaurants in and around Delhi to make the reservation as soon as possible? If you are in a mood to celebrate Valentine’s Day like never before, then you must avail some exciting Valentine’s Day offers today. Save money but don’t compromise the restaurant. Luckily, there are so many good restaurants in Delhi/NCR to go to. Having said that, if you are wondering where to go for a romantic Valentine’s day dinner with your better half then you have come to the right place. 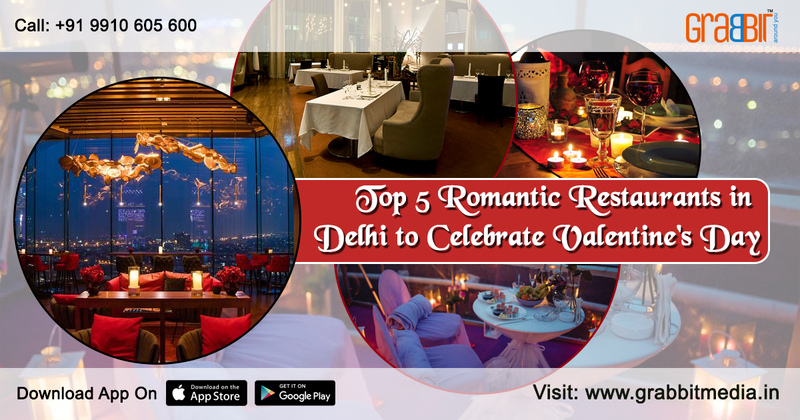 We have curated a list of top 5 romantic restaurants that you can go to, to celebrate the day of love. If you want to go to only the best romantic restaurants in Delhi, you must book a table for two at the Sky High restaurant. It is simply the best place to be at with your partner. The ambience and the decorative lights are mesmerizing. Plus the food is fantastic. With live music and dim lights, this place will create the perfect Valentine’s day ambience for both of you. Are you looking for a Valentine special restaurant in Delhi, then travel to Hauz Khas on 14th February! Mia Bella is beautifully decorated and attracts a lot of lovebirds on Valentine’s day. Our suggestion is to come here a little early to grab the best seat. If you get the perfect seat then you can also have a chance to have a lip-smacking lunch with the best lakeside view. If you are looking for restaurants for Valentine’s near me then you should try Masha. This is in Hauz Khas as well. Masha has a rooftop kitchen and a bar. The perfect ambience and view will create a great ambience for Valentine’s day. They serve delicious delicacies with live music. Don’t miss to come to Masha for 2019 Valentine’s day. For the best restaurant deals and offers in Delhi, you should definitely go to Seville- the Claridges. During Valentine’s day, Seville offers a lot of exciting discounts and hence it is worth reserving a seat here on that day because it is bound to attract a lot of couples. This quiet restaurant is a favourite among love birds and families. The ambience is great and the food is equally delicious. For a romantic Valentine’s day dinner, you should go to Qla. The contemporary interiors, pleasant interiors and perfect ambience will leave no stone unturned to compliment Valentine’s day mood alive. If you want to have a fine dining experience in near Delhi, then Qla is the place for you. These are our top 5 picks for the best Valentine’s day restaurants that you should try. Remember many couples will be trying their luck to reserve a seat for them. Hence, reserve a seat as soon as possible to avoid disappointments. Are you Looking For Best Property Dealers in Delhi?